Is Skye reaching the limit for tourists? 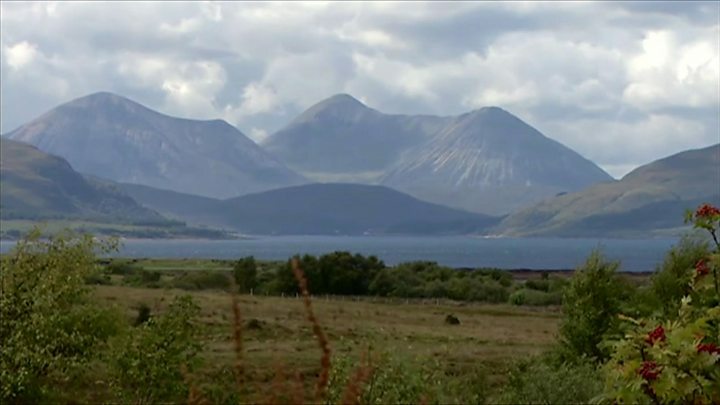 The Isle of Skye is one of the most beautiful places in the UK but its services are being stretched by the number of tourists flocking there to enjoy the rugged mountains and sea lochs. According to the Skye Boat Song, Bonnie Prince Charlie's boat sped over the sea to the island "like a bird on the wing". As you cross the Skye Bridge these days the chances of flying swiftly over the crossing are small to vanishing. Crawling is more like it, behind a queue of caravans, motor homes and cars, packed with kids and luggage. Skye is bursting at the seams. So much so that Police Scotland has advised visitors to use "common sense" before travelling to the island for an overnight stay without booking accommodation. They said people regularly arrived at the police station with nowhere to stay asking for advice, but unless they planned ahead they could end up spending the night in their car. The attraction of the island, which sits off Scotland's north-west coast, is obvious. It is dominated by the magnificent Cuillin mountain range whose rocky slopes provide some of the most dramatic scenery in Britain. Then you throw in a stunning combination of sea lochs, rivers, pools and scenic harbour towns, just to complete the mix, and it is little wonder that Skye is so popular. But it is widely accepted that the island's infrastructure is under increasing pressure from drive-through tourism. Some of Skye's most stunning locations are victims of their own success, suffering increasing amounts of road and path erosion. I went to Glen Brittle, the entrance to the Fairy Pools, one of the most picturesque picnic sites in the UK. It was absolutely packed with people. Cars were parked all the way along the side of the single-track road. Many vehicles were up on the grass verges, with some becoming stuck and having to be pushed out. The road was almost blocked and campervans struggled to get through. From the cars there was an almost constant stream of people heading into the site. American tourists Scott and Susan Littlefield, from Washington State, told me Skye was "amazing". Scott said: "It's something you don't see anywhere else." However, Scottish tourist Claire Anderson warned: "It has been lovely and everything is very beautiful but there are so many tourists and there is not the infrastructure to deal with that. "Unless they manage it in some way I fear that the prettiness is going to get damaged by all of us trudging through." Skye has always been popular but its international profile has been raised by a number of blockbuster films which have used its unique beauty as a backdrop. Most recently King Arthur: Legend of the Sword, and Transformers: The Last Knight both used the island, as well as pop star Harry Styles in the video for his single Sign of the Times. The Quiraing has long been a popular destination for hillwalkers. Roger Booth, who has a snack van on the Quairang, told me he was worried the traditional walkers could be put off by the number of people now visiting. He says: "People come to where the films were made, jump out of their car or coach, take a quick picture and are gone again. "There is nothing coming into the island economy from some of these big companies." Mr Booth says the number of tourists was causing problems. "It has changed probably tenfold the number of tourists," he says. "It has increased to the point where any journey, if we go to Portree for stock in the morning we have to leave at 8am because we know any later the road is going to be absolutely gridlocked." It is clear that the pressure is growing and some people on the island think that there needs to be solutions. Shirley Spear, who runs the renowned Three Chimneys restaurants, is setting up an organisation that will pitch for government grants to improve the island's infrastructure. She says: "We have successfully driven tourism as an industry forward into the modern world. "It is very successful in Scotland and it is huge economic driver but we need more support. "I believe there should be a special fund to help bring the infrastructure into line with expectation of our many visitors from many countries around the world." Another suggestion to tackle the issue is a "tourism tax" or even making the island a national park. The Scottish government is not in favour of a tourism tax but it says it is open to discussion about these issues. Brexit and the low value of the pound seem likely to bring more visitors to Skye. People like Shirley Spear believe some way will have to be found to make tourism more sustainable otherwise there could be long-term damage to Skye's unique beauty.